Oak is the easiest way to learn guided meditation in just 10-minutes a day. Meditate to the sound of distant rain, waterfalls, or other soothing background tracks. Oak’s simple mindfulness practice is a great way to reduce stress, improve sleep, and find a natural balance in life. Many people use Oak just for the powerful breathing exercises. Featuring Box Breathing, Deep Calm (4-7-8), and Awake breathes. Whether you’re in need of some quick relaxation or a boost of energy, these yogic exercises are easy to perform, even on the go. Advanced users will enjoy our unguided meditation timer. Set your custom mediation length, background track, and interval chimes. Your Oak user profile tracks your meditation and breathing process over time. Including your minutes meditated, number of breaths taken, and consecutive days (streaks). We also support Apple HealthKit for tracking “mindful minutes” with the Health app (optional). We offer guided meditations from both male and female instructors. Choose a session duration of 10-30 minutes in length. Looking for a dose of wisdom? Check out our ever-expanding Wisdom section full of audio and video content from Alan Watts. Guided meditation with calming sounds and breathing exercises. 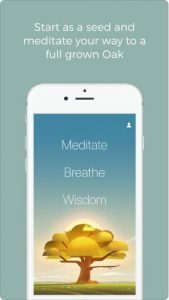 This is a super simple but effective meditation app and the best app for Transcendental Meditation I’ve used. Easy controls, the ability to do unguided meditation and even tells you how long extra you’ve been going after your 20 minutes so you can get a nice 2 – 5 minute come up. The breath feature is very nice and adore the wisdom feature which gives little sound clips or videos on the philosophy of meditation – I hope more is added soon though! Simple, effective and free from ads. The voices are very pleasant – the issue I had with Headspace was that I found the narrator’s voice rather annoying and distracting. This is much better, and it keeps it simple: there’s the time-proven meditation where you follow your breath and three breathing exercises. Furthermore, I love that I can add a background noise to the meditation to drown out my housemates during practice. All in all, a well rounded option for beginners and seasoned meditators alike.